Stylistically you can’t go wrong with a satchel. This high-shine patent leather number is small enough to be worn across the body. Very ladylike and available in happy colours. 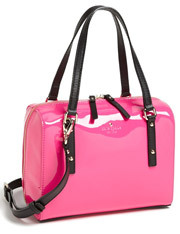 As I write this bag is on sale for $208.80. 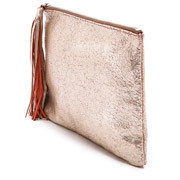 This rough textured clutch with casual tassel in platinum or rose gold is perfect to add a touch of daytime sparkle to your outfits. Perfect with a pair of jeans. 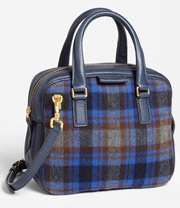 A beautiful little tartan bag with top zip closure and optional, adjustable crossbody strap. Casually structured. This will give you a burgundy and blue fix for the season. Fab dressy bag with a strong casual integrity. 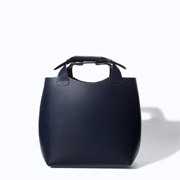 A structured hobo is a rare breed, and this colourblocked number is architectural and surprisingly lightweight. Lies flat against the body. Also available in red and black. 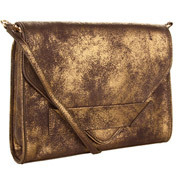 This distressed metallic darling doubles as a clutch when you want to give the straps a break. 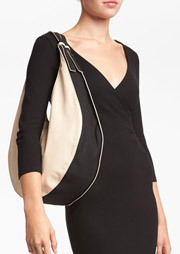 I especially like the juxtaposition of an angular bag like this with roomy, arty frocks and skirts with lots of drape. 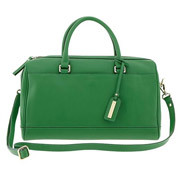 The structured bag then adds extra polish. As I write this bag is on sale for $189.99.